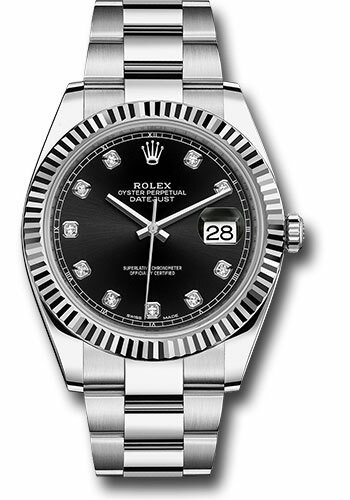 Rolex watches are perhaps the most important brand in the Swiss Watch industry. They are instantly recognizable and symbolize both important status as well as engineering excellence in wristwatch manufacturing. The Rolex Company was founded back in 1908 in London and then in 1919 found a permanent home in Geneva Switzerland. Rolex is responsible for many groundbreaking achievements in watchmaking including the first brand to manufacture an oyster perpetual waterproof watch, featuring a date window, dual timezone GMT timepiece technology and also the first watch to get COSC chronometer certification. All Rolex watches are certified as chronometers by the Swiss Official Chronometer Testing Institute. This intensive process includes stress-tests on the watch that last 15 days and 15 nights under various conditions. On every Rolex timepiece each case, bracelet, dial, bezel, hands, clasps and movements are all made in house. Rolex offers watches for just about every style preference. In the sports active models you can choose from the GMT II, Submariner, Sea-Dweller, Yachtmaster, Yacht-Master II, Explorer, Explorer II, Daytona Chronograph or Milgauss models. For something a little more traditional we suggest Datejust or Datejust II watch models and they are made for Men and Ladies in sizes of 26MM, 29, 31, 34, 36 and 41 millimeters with a choice of metals as well: Stainless Steel, 18K Everose Rose Gold, 18K Yellow Gold, 2 tone, 18K White Gold or Platinum. For the ultimate in Luxury Rolex makes precious watches like the President, Masterpiece Pearlmaster, Cellini and the Sky-Dweller. Other options include smooth, domed or fluted bezels, deployant buckle, diamond dial, mother of pearl dial, meteorite face, diamond bezel, crocodile or leather strap. There is a very active brand new and pre-owned used Rolex marketplace and this will insure strong resale value. We love selling authentic Rolex watches at a discount price as it is a solid brand that will never go out of style and is also certain to perform well for generations.